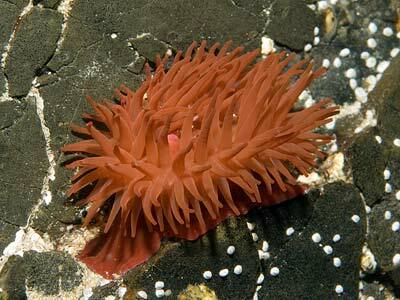 Description: This sea anemone has a smooth column divided into a scapus and a narrow capitulum, with a well-marked parapet and fosse. Blue (rarely white or pink) rounded warts are present in the fosse. The tentacles are moderate in length, never banded. The colour is variable: most shades of red, brown, orange or green, usually plain all over but sometimes with blue or yellowish spots or streaks on the column, mostly with a blue line around the edge of the base. Size up to 50mm across the base. 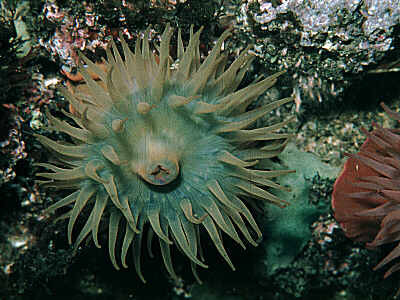 Reproduces by viviparity, producing fully formed young anemones. 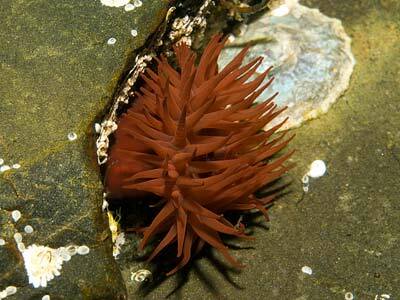 Habitat: Found on any firm substrate, rocks, stones, breakwaters, etc. From high on the shore to the shallow sublittoral, about 20m depth, but typically a shore species. Distribution: Very common on all coasts of Britain. Throughout western Europe, south to the Mediterranean and probably to the coast of west Africa. Similar Species: Genetic investigation suggests that some of the different colour morphs of Actinia equina may be distinct species. Blue warts in fosse are diagnostic of this species and Actinia fragacea. Picton, B.E. & Morrow, C.C. (2016). Actinia equina (Linnaeus, 1758). [In] Encyclopedia of Marine Life of Britain and Ireland.